The EdgeMarc 4610W combines multiple voice and data features into a single, easy to use network services gateway. It features 24 x 10/100/1000 Mbps PoE LAN Ports, up to 4 T1 WAN interfaces, 1 x 10/100 Mbps Ethernet WAN, 802.11 Wireless Access Point for data and support for PRI to connect to PBX's. 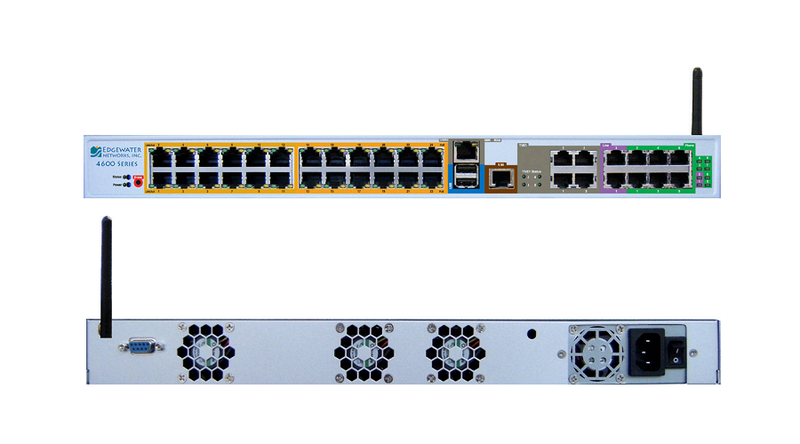 All-in-one One box for your data router, PoE switch, analog ports, firewall, WiFi, VoIP ALG - with a single management interface. Scalability Whether you need a single T1 or a 4 X T1 interface, the EdgeMarc 4610W is cost optimized for businesses of all sizes. Survivability VoIP calls can be re-routed locally or over the PSTN during WAN link failures - using one device. Quality of Service Packet prioritization and data traffic shaping for VoIP calls. Simplified Troubleshooting MOS statistics, call monitoring, LAN/WAN problem isolation from the router, Integrated VoIP Test Call Agent, TCPdump, PING , Traceroute and more.